The SpaceX Dragon commercial cargo craft is grappled by the Canadarm2 robotic arm at the International Space Station. This image was taken May 25, 2012. After a more than a week in orbit, the private space capsule Dragon is preparing to return to Earth from the International Space Station and cap off its historic mission with a splashdown in the Pacific Ocean. Dragon is due to be released from the station early Thursday (May 31) and splash down a few hours later. The return to Earth is the last major hurdle for the groundbreaking spacecraft built by Hawthorne, Calif.-based Space Exploration Technologies Corp. (SpaceX). 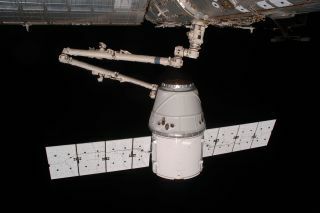 The unmanned Dragon space capsule is the first commercial spacecraft ever to visit the International Space Station. It docked at the space station on Friday (May 25), three days after blasting off atop a SpaceX Falcon 9 rocket from Cape Canaveral, Fla. So far, the landmark test flight has gone smoothly, with Dragon meeting each of its mission milestones with very little deviation from its flight plan, SpaceX officials said. Now Dragon has one last challenge: the trip home. SpaceX's Dragon capsule is rare in its ability to survive re-entry to Earth and be recovered. Most automated cargo vehicles that visit the space station, such as those built by Russia, Japan and Europe, are designed for one-way trips only, and are destroyed after their missions as they plunge through the planet's atmosphere. Dragon is equipped with a heat shield to withstand the fiery temperatures of re-entry, which can reach about 3,000 degrees Fahrenheit (1650 degrees Celsius). That means it can deliver cargo both to and from the space station. "It's still a very challenging phase of flight," Couluris said. "Only a few countries have done this so far, so we're not taking this lightly." Dragon is packed with a total of 1,367 pounds (620 kilograms) worth of cargo for the return trip, including crew items, completed science experiments and used station hardware. SpaceX plans to deliver some high-value experiments back to NASA within 48 hours of splashdown, with the rest of the cargo to be sent to the space agency within two weeks. The mission is a trial run for SpaceX's plan to fly 12 cargo-delivery missions to the orbiting laboratory over the next few years. The company has a $1.6 billion contract with NASA under its Commercial Resupply Services program, which has partnered with private industry to fill the gap left by the retired space shuttles. SpaceX was founded in 2002 by billionaire entrepreneur Elon Musk, who also co-founded internet payment service PayPal. NASA's Mission Control in Houston has worked closely with the SpaceX team in Hawthorne throughout the flight to coordinate Dragon's approach and operations at the space station. "We really learned how we worked together as a team and overall that went very well," NASA flight director Holly Ridings said today. "Mostly we learned that to bring in a new partner, the SpaceX team, we were able to communicate and accomplish something very complicated." Dragon is currently berthed at the station's Earth-facing Harmony node. At 4:05 a.m. EDT (0805 GMT), astronauts onboard are scheduled to use the station's robotic arm to detach Dragon from the outpost, with a plan to release it from the arm at 5:35 a.m. EDT (0935 GMT). At 10:51 a.m. EDT (1451 GMT), Dragon will fire its engines to exit orbit and begin the fall back to Earth, with a splashdown about 490 nautical miles southwest of Los Angeles targeted for 11:44 a.m. EDT (1544 GMT). Recovery ships will be waiting in the area to collect the capsule and haul it back to land as soon as possible.